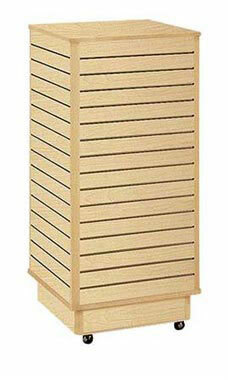 Create a memorable display for your customers with the help of this Maple Slatwall Tower. The unit has a wood grain melamine finish and rolling base. Therefore, the display can be moved with ease at any time. Add accessories come in multiple sizes and include slatwall shelves, brackets, faceouts, peg hooks, and other display options. The Maple Slatwall Tower with Rolling Base measures 24'' x 24'' x 48''H. All towers are in stock and ready for immediate shipment upon order.